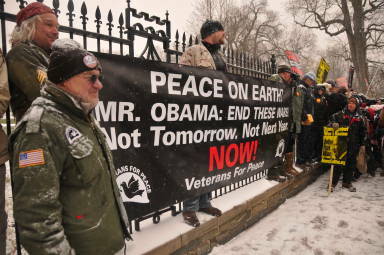 Veterans at the White House, December 16, 2010. Photo by Ellen Davidson. After a 10 am rally in Lafeyette Park featuring Marine Corps veteran and Pentagon Papers whistleblower Daniel Ellsberg, Veterans For Peace National President Mike Ferner and VFP Vice-President and retired Navy Commander Leah Bolger, Iraq vet and March Forward! co-founder Mike Prysner, and others, activists formed a solemn single-file procession to the White House, silent except for a drum beat. There, they encountered police barricades. Some veterans began climbing over the barricades, until the police opened them up, allowing people to approach the fence in front of the White House with their banners and signs. As the light snow increased to heavy and began accumulating, activists kept warm by singing and chanting. At about 12:30, police began arresting protesters who remained along the fence, while supporters who did not want to risk arrest were moved across the broad street. Some of the demonstrators stood in the snow and freezing temperatures for nearly four hours before being arrested and taken to Anacostia processing center. In total, at least 131 people were arrested. They have all since been released. Some have elected to pay a fine, while others, including Ellsberg and McGovern, will go to trial on the charge of disobeying a lawful order. Kathy Breen, Carmen Trotta, Matt Tessitore and I joined Dorothy Day’s grand-daughter Martha Hennessy, two local members of Veterans for Peace, Professor James Marsh of Fordham University, and three others in a symbolic blockade of 44th Street opposite the military recruiting station in Times Square. We were all taken to the midtown south precinct, and released later in the evening with summonses for Disorderly Conduct. We’ll be going to court on March 1st for this arrest. We certainly appreciate the support we got from over a hundred people who chained themselves to the White House fence, and look forward to sharing our stories with them, in the hopes of a rekindled antiwar movement in the days to come. And in San Francisco, 26 war opponents were arrested for obstruction after a die-in in front of the Federal Building.